Hawthorn Street will be closed about 4:00 a.m. on Thursday morning, July 18 at North Irving Ave. (by Town Hall) and will only be open to emergency vehicles and pedestrian traffic. This includes the metered parking area on Beach Terrace (from the Town Pier to the Cannon near the restrooms). The Trolley stop will be located on N. Irving Ave. across the street from Town Hall. Taylor Street will be closed to through traffic at Dennison St. (at High Tides) but traffic will still be able to access the business parking areas on Taylor St. behind the visitor center and beside High Tides. Fishing from the pier will not be allowed Friday, Saturday or Sunday from 10:00 a.m. to 7:00 p.m., but the pier will be open to spectators for watching the jetski races. Street closings and fishing restrictions will be in effect through Sunday July 21 until 7:00 p.m. or at the conclusion of the races. The 2012 jetski races were held on July 21 & 22. The jetski races were back in town for the second year in a row! 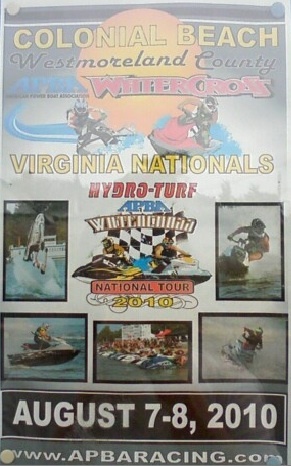 In 2010, it was the HYDRO-TURF APBA Watercross Nationals. In 2011, it was the UWP ISJBA National Tour. 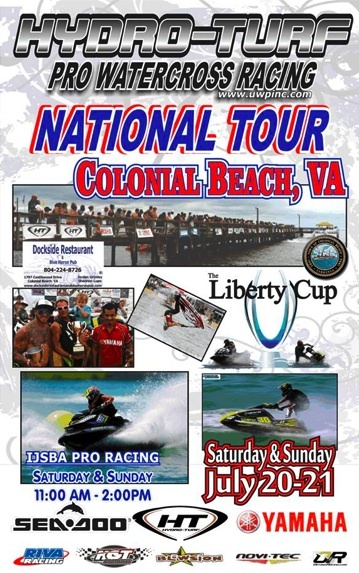 Events kicked off on Friday morning, July 29th at the Town Pier with the Corporate Jet Ski Races. Businesses that competed were: Dockside Restaurant, WGRQ 95.9, Thunder 104.5, Rankins Hardware, Monroe Bay Campground, Riverboat on the Potomac, Lighthouse Restaurant, Tow Boat US, High Tides Restaurant, Colonial Beach Volunteer Fire Department, Beach Service Center and a "ringer" racing team by Trinity Builders. Congratulations to Team Dockside and Team Beach Service Center for taking the top spots in the competition. Hawthorn Street at Irving Ave. closed beginning at 4:00am on Thursday, July 28, 2011. Hawthorn was closed to vehicular traffic, but remained open for emergency vehicles and pedestrian traffic. Taylor Street was closed to through traffic at Dennison Street. Traffic was able to access the business parking areas on Taylor Street next to High Tides. The metered parking area on Beach Terrace, adjacent to the Town Pier, was also be closed to through traffic from the Town Pier to "The Cannon" at the corner of Irving and Boundary St. The Colonial Beach Trolley made a special stop at North Irving Avenue across from Town Hall. No fishing was allowed on the Town Pier on Friday, Saturday or Sunday from 10:00am – 7:00pm. The Pier was open for spectators. 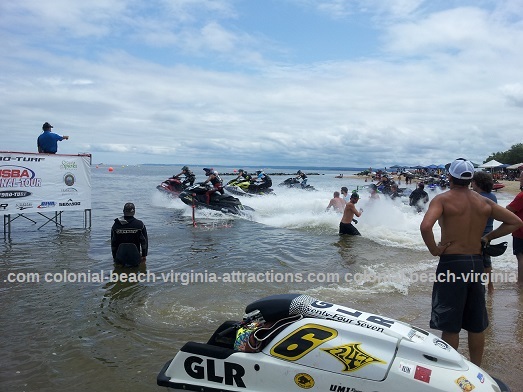 Colonial Beach welcomes the jetski races! The two-day attraction features six events, Rounds 9 and 10 of an eleven-round series to determine the U.S. National Tour Champions in eleven different Pro-Am and Expert racing classes - including Women’s classes! A 1,200' by 700' area will be set up in front of the town pier and to the right of it for the jetski races. The pier will be open for spectators to view the event. A cooling tent will be located near the pier at the end of the Boardwalk. The 2010 series consisted of five double-round events spread all across the United States, culminating in the final stop of the tour, the HYDRO-TURF APBA Watercross Nationals in Nashville, Tennessee in September (a double points round). Each round was filmed and a half-hour show from each round aired on three different cable networks. Food vendors and arts & crafts booths were on site both Saturday and Sunday. Radio Station 93.3 WFLS were on hand for a live broadcast on Saturday, and Classic Rock 96.9 broadcast from the event on Sunday. Beginning on Saturday, August 7th, the intersection of Hawthorn and Irving Avenues will be blocked, and vehicular traffic on Taylor Street will be blocked from turning on to Hawthorn. Streets will be closed until August 8th at 6pm. Signs will be posted to direct all traffic. In addition to the side streets and Town Hill being open for parking, volunteers from the Colonial Beach Chamber of Commerce will help direct traffic to other designated areas in town. Drivers are encouraged to drive to the intersection of Colonial and Washington Avenues to be directed to the proper location on Town Hill or one of the auxiliary spots in town. The cost of parking for the entire day is $10. The Wilder Avenue parking lots will be closed to the public and will be used for jetski racers. Ride the Town Trolley and eliminate all the traffic and parking hassles. Colonial Beach has hosted similar races in the past. Read about it here!